Rey O'Neal, a 1970 founding member of the British Virgin Islands Athletics Association and a 1980 founding member of the BVI Olympic Committee, was honored during a tribute evening black tie dinner on Saturday night at Maria's By The Sea, where he received the International Olympic Committee's Pierre de Coubertin trophy. The award, presented to O'Neal on behalf of the BVI Olympic Committee by the territory's most successful athlete, sprinter Tahesia Harrigan-Scott, was for his efforts in promoting and encouraging the practice of sports in the BVI and the Caribbean as well as and inspiration to all involved in sports. O'Neal is the longest serving president of both the BVI Athletics Association and the BVI Olympic Committee. He was BVIAA president, 1970-73 and 1978-2003. He served as BVIOC President 1980-84 and 1988-2006. "Perhaps his greatest contribution to us in the Caribbean has been his eagerness to compile almost on an annual basis, a lot of top performers of our region in the different events," noted St. Vincent and the Grenadines' Olympic Committee Secretary General, Keith Joseph, who's also the president of the athletics association. "Once the OECS was established, he produced statistics on the athletes of the sub region, a treasured document that has served us very, very well." Others paying tribute to O'Neal included former USVI Commissioner of Commerce and IAAF Honorary Life Vice President, Amadeo Francis; IOC member Austin Sealey of Barbados-who founded the Carifta Games and Puerto Rico's Victor Lopez, president of the North American, Central American and Caribbean Athletics Association. All singled out O'Neal's dedication to track and field and he has been considered a walking encyclopedia, because of his wealth of knowledge across sports. 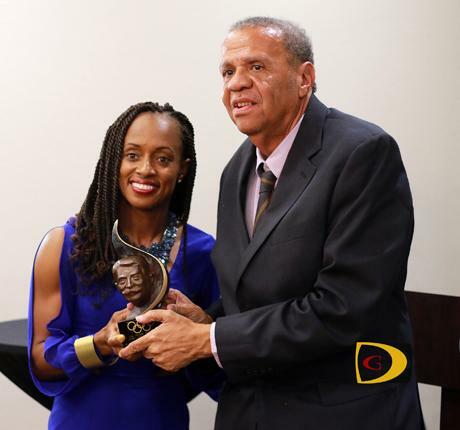 Francis, who was the featured speaker, said O'Neal merited the tribute as he contributed so much to the growth and development of sports in the BVI and the Caribbean. "As a long time friend and collaborator of one of the works I have authored, namely the history of Pan American Jr. Athletics Championships, I have been indebted to him for his contributions in selecting the teams that represented the Americas at the IAAF World Cup in Athletics, while I president over the Pan American Athletics Commission." Joseph noted that O'Neal who received the IAAF Veteran Pin in 2003 and Officer of the British Empire (OBE) in 2005 facilitated the linking of athletes from regional countries with US Colleges and Universities for athletics scholarships. "Many of us in the region have been called and told of an opportunity for an athlete at this or that educational institution," Joseph added. "More than this, he sought to match the athletic qualify and academic standing of the athlete with Colleges he considered most appropriate to their standing." O'Neal who taught at the BVI High School and was House Master of Lincoln House during his tenure which was renamed in his honor at the Elmore Stoutt High School, said the evening was very satisfying and it was good to see so many former students, athletes and friends who we grew up with in Road Town showing up. "It's nice," he said. O'Neal said among his greatest memories, was getting the BVI Athletics Association off the ground in 1970, followed by the 1975 participation of athletes in the Central American and Caribbean Championships in Puerto Rico. "The first (IAAF) World Championships in 1983 was also a significant event, as well as the CAC Games in Havana the year before, and that was followed by the Olympic Games in Los Angeles in 1984," recalled "O'Neal. "The Commonwealth Games in 1990, which was just Chef (Lindel Hodge) and I participated. The OECS Championships between 1987 and 1991, those were fun meets. It's been a pleasant ride. It had its ups and downs-more ups than downs-but, you take it as you got it."